Omari Philyaw‍ is in the early stages of his recruiting process, but things are trending in a positive direction as the 2022 North Carolina cornerback already has an offer from Charlotte and interest from multiple other top programs. The Mount Island Charter High School standout was in South Bend on Saturday to get his first look at Notre Dame. 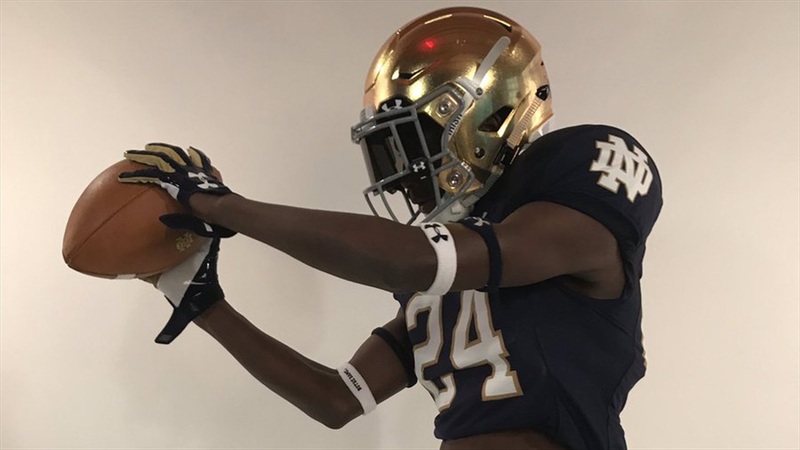 The 5-foot-10, 165-pound freshman spent much of his time on campus with Notre Dame defensive backs coach Todd Lyght. “He taught me a few things, the basics,” said Philyaw. “He talked more about academics than athletics. I had a good time with him. Philyaw was impressed with what he learned from Lyght about Notre Dame’s academic prowess. Philyaw, who made the trip with his Mount Island Charter teammate Gabe Stephens, also attended the Irish’s morning practice. The campus also made a positive impression. Lyght invited both Philyaw and Stephens back for camps this summer, but they’ll have to see if that works with their high school team’s schedule. Either way, they’re both looking forward to returning to South Bend in the future and showing the staff what they can do. “Overall, I think I can play offense and defense pretty well as far as route-running and coverage, the basic stuff,” said Philyaw, who added he’d like to learn more about the way Notre Dame’s defensive backs do things. Philyaw has a trip to Penn State scheduled in a couple of weeks and also expects to make stops at Wake Forest, Old Dominion and South Carolina.